I’m happy to share the code from a Facebook app I created for a workshop earlier this year. The application is very simple; it creates a Facebook object, performs calls to get data belonging to the current user, then prints the data exactly as it is returned. 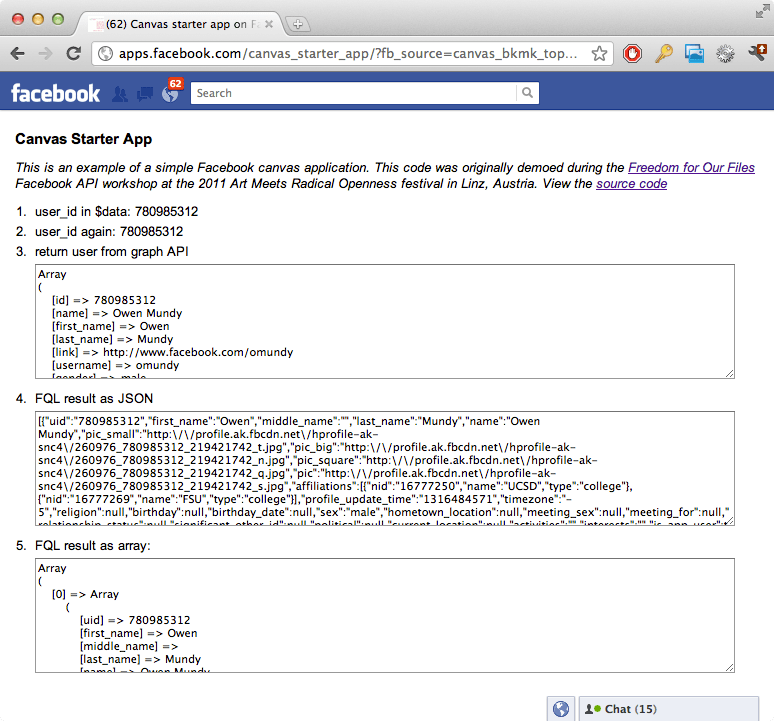 It has examples of basic Facebook Graph API calls as well as an example of FQL (Facebook Query Language). This entry was posted on Thursday, December 22nd, 2011 at 9:10 pm	and is filed under code, launch, sketches. You can follow any responses to this entry through the RSS 2.0 feed. You can leave a response, or trackback from your own site. Entries (RSS) and Comments (RSS). 44 queries. 0.531 seconds.